The Hampton Inn Houston-Near the Galleria hotel is located in Houston Texas in the upscale Post Oak-Galleria area near the Galleria Mall Houston Business District downtown Houston and Greenway Plaza. Other attractions close to this Houston Texas Hampton Inn hotel include the George R. Brown Convention Center Reliant Park Complex and Expo Center Minute Maid Park Rice University Texas Medical Center the Houston Zoo and NASA Space Center to just name a few. The Hampton Inn Houston-Near the Galleria will be undergoing a three million dollar renovation beginning June 9 2008 - September 30 2008. 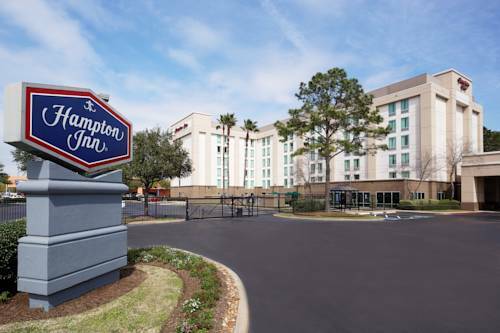 The Hampton Inn Houston-Near the Galleria hotel features 176 rooms non-smoking floors connection rooms whirlpool rooms walk-in showers 25**TV with cable voice mail cribs hair dryers irons ironing boards coffee maker and micro-fridge combos in some rooms. Additional amenities at this Houston Texas Hampton Inn hotel include a hotel exercise room or access to workout at 24-Hour Fitness an outdoor heated pool complimentary business center with boardroom and 2 meeting rooms and valet laundry and room service /from Takeout Taxi and Order Inn/ for an additional fee. Guests of this Houston Texas Hampton Inn hotel will also enjoy the complimentary On the House/TM/ hot breakfast and the On the Run/TM/ breakfast bags /available Monday-Friday/. We love having you here at the Hampton Inn Houston-Near the Galleria hotel in Houston Texas. All reservations must be guaranteed with a major credit card or adv cash deposit to hotel regardless of time of arrival. All reservations must be cancelled 24 hours host time unless deposit required. Policy subject to change.